Posted by thetickthatbitme in Diagnosis, TBI Facts, Treatment. 1. You don’t have to be in the Rocky Mountains to catch RMSF. There are four types of ticks in the U.S. that can transmit this bacteria to you: the American dog tick (Dermacentor variabilis), Rocky Mountain wood tick (Dermacentor andersoni), brown dog tick (Rhipicephalus sanguineus), and the Cayenne tick (Amblyomma cajennense). Cases of RMSF have been reported all over the U.S., and there have also been some in Canada. In 2008, all but 8 states reported cases of RMSF to the CDC. 2. 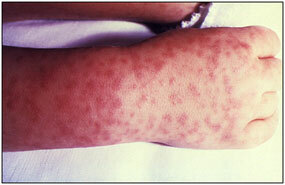 Rocky Mountain spotted fever can be a deadly disease if not treated promptly. The national fatality rate is about 3%, but this rate is much higher in certain states like Arizona, where the fatality rate is 10%. This is likely due to delayed diagnosis. 3. Patients infected with the Rickettsia rickettsii bacteria that causes RMSF may experience any combination of the following symptoms: chills, confusion, fever, headache, muscle pain, rash, diarrhea, light sensitivity, hallucinations, loss of appetite, nausea, thirst, and vomiting. Though 90% of patients develop the spotted rash, this often comes late in the illness, so if other symptoms are present, you shouldn’t wait to get treated. Ten percent of patients never develop the rash. 4. RMSF can be diagnosed with a blood antibody test called an IFA (indirect immunofluorescence assay), but this test is often negative in the first week or so of infection. If you are showing symptoms of RMSF, your doctor shouldn’t wait for blood test results before putting you on antibiotics, because the longer treatment is delayed, the higher the risk of fatality. 5. RMSF is treated with Doxycycline in both adults and children. The usual course is between 7 and 14 days. The CDC recommends treating for at least 3 days after fever subsides. 6. Another way to get RMSF is by squashing ticks that you find on your dog (or anywhere else) with your bare fingers. When you squish a tick, the bacteria inside it can come out and enter your body through your skin. When checking your pets for ticks, always wear gloves, and use tweezers for tick removal. 7. Although very rare, it is possible to get RMSF from a blood transfusion. If you experience symptoms of RMSF following a transfusion, see your doctor right away. 8. The symptoms of RMSF can mimic those of other TBIDs, like Ehrlichiosis and Anaplasmosis. Luckily, all three of these are treated with Doxycycline. If you want to read more about RMSF, check out the fact sheet, which is full of links to additional information. excellent post. you always provide such accurate and relative info..thanks for that!